There was a day when the world realised they’d had enough of America. It wasn’t when America turned its back on the Herculean effort to sign the world up to the Paris Climate Agreement or TTIP or America’s continuous support for Israel’s murderous actions in Gaza or various other deals that took years to iron out and negotiate that have since been trashed. It was a moment we knew was going to happen but least expected to prove so important. This was a deal that took the combined effort of the European Union, the United Kingdom, Germany, France, China and Russia. It took twelve years to negotiate. America was a key player and the deal signed, sealed and delivered on October 18th 2015. It was the Iran nuclear deal. That landmark agreement stopped the escalation of nuclear weapons programs, not just in Iran, but actually in the Mid-East more widely. With no evidence from any source of Iran breaching its nuclear deal, Iran now has many trading partners. However, America was not one of them. Rightly, the Iranians did not trust their old foe. And so it came to pass that Donald Trump withdrew from the deal, as expected last month. Palpable European anger to protect the deal and keep it on track spawned a completely new global confidence to move in the same direction. The EU had prepared banking and trading systems to support EU companies doing business with Iran. China was committed having signed a huge joint oil pipeline deal and then launched the petroyuan. Russia has many reasons to protect this deal – obviously and also trades not U.S.Ds but Rubles and through a bartering system. Then India announced a few days ago a trade deal with Iran, again bypassing U.S.Ds. Then EU diplomats, working on a collaborative agreement in Cuba since 2016 announce that deal to be done and dusted just a few days ago. Last week, 14 African countries announced their intention to switch from U.S.Ds to China’s Yuan. All have dumped trading predominantly in U.S. dollars for one reason or another. On the 10th May, the EU declared that America had just become Europe’s number one threat to its economy. The EU and China announced on Friday (1 June) that they would expand trade and investment cooperation amid the global trade dispute triggered by U.S. tariffs. In the context of growing uncertainties in the world, it is even more important for China and the EU to deepen our strategic partnership. What has really happened here is a global pivot. Leaders are striking whilst ‘the iron is hot’. Wang’s visit to Brussels, in the framework of the annual EU-China high-level strategic dialogue, came hot on the heels of U.S. President Donald Trump’s confirmation of additional tariffs against Europe and other nations’ steel and aluminium exports. Trump has, to all intents, ended up galvanising other world leaders into real action. This pivotal moment may take some time to be made fully functional, maybe decades. In the meantime, China’s One Belt One Road or Belt Road Initiative (BRI) costing nearly $1trillion is well underway and cannot be ignored. 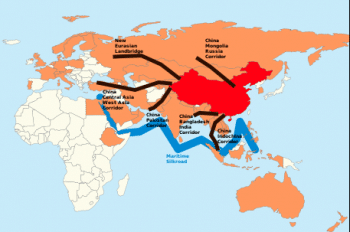 A modern Silk Road that links China, Russia, Europe and Africa in trading routes across land and sea. symphony of all relevant parties. Beijing believes it will kick start “a new era of globalisation”. One party not included in this symphony is America. 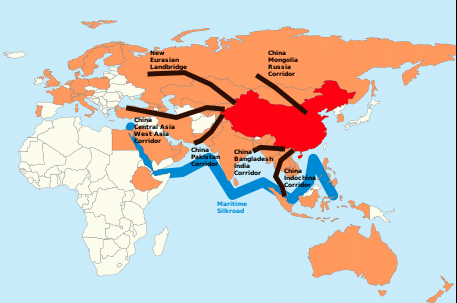 According to the global consultancy McKinsey, the BRI has the potential to massively overshadow the US’ post-war Marshall reconstruction plan, involving about 65% of the world’s population, one-third of its GDP and helping to move about a quarter of all its goods and services. The ‘belt’ is a series of overland corridors connecting China with Europe, via Central Asia and the Middle East. One year ago last May, China hoped to put some meat on the bones at an international forum in Beijing but the initiative was greeted with a mix of excitement and suspicion. Beijing saw 28 heads of state and government leaders but German Chancellor Angela Merkel turned down an invitation as did U.S. president Donald Trump. Today, that initiative now looks like a go. Europe has all but given China the green light. Merkel included. America has just proven itself to be the new bogeyman on the international geopolitical block. It is headed up by an unstable administration whose warped worldview, beset with paranoia sees nothing but enemies hiding in the dark. It wants a destabilised world because that’s what America does best and profits from most. In the meantime, everyone else just wants to trade, get on and make some money.